This authentic log home offers simplicity and luxury all in one. 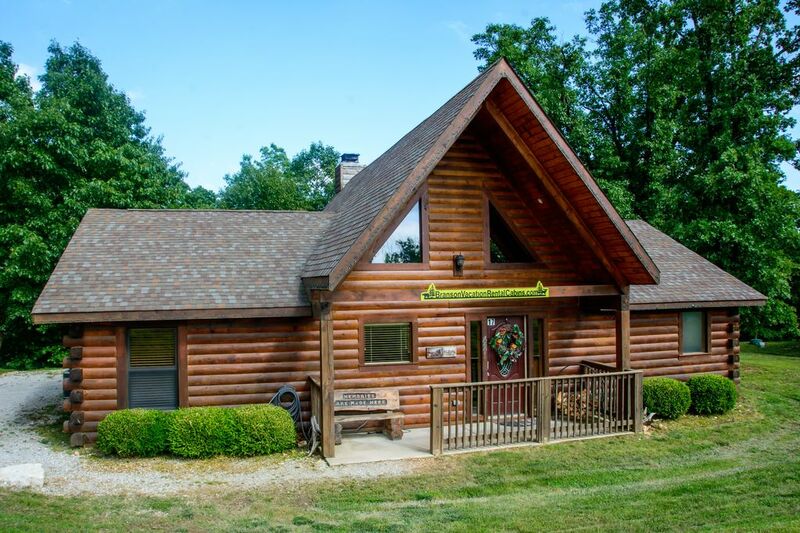 Cricket Creek Cabin is conveniently located to the attractions of Branson, yet still offers seclusion from the city to enjoy the peaceful sounds of crickets, tree frogs, and whip-poor-wills. Enjoy views from the back patio or the front porch. Gorgeous dogwoods and strong tall oaks surround you, and you can even smell the fresh pond just down the way. You can also sit out by the fire pit or go for a stroll around the property. Plus, the playground for the kids, and the community pool are nearby. The luxurious cabin features a wood burning fireplace and a jetted tub. Hoping to make your stay as comfortable as possible, we also provide towels, a hair dryer, iron, and ironing board. Cricket Creek Cabin sleeps 8 people, but is still perfect for 1 or 2. It’s the perfect getaway for ultimate rest and relaxation. Come and experience one of the best kept secrets in the greater Branson area. Don't wait, book Cricket Creek Cabin today! I can’t say enough good things about the property. Things were clean, well kept up, stocked and very comfortable. The area is quiet and tucked into the woods. We had neighbors and there was some traffic because of the fishing tournament but unless you went looking for it, it didn’t disturb us. The location was nice because it was about 10-15 minutes into Branson. The check in and check out was really easy. Great spot away from the hub bub of Branson, but not a far drive to those events and very close to golf and water sports. The cabin was very quite and beds very comfortable. Had no trouble sleeping despite a "truck show" on the nearby property. You could hear the music and revving of engines if outside, but inside it didn't bother me at all. Beautiful property to walk around too. We had a wonderful stay in the Memory Maker Cabin. Very clean, well stocked and perfect for our needs. The grill was broken and it was a bit of a hike to the pool but these were our only complaints. Overall an amazing place and we will be back! The privacy of the cul de sac with the woods behind us and the rustic (but clean and updated) decor, lent itself to a relaxing family get away for our sons and two grandchildren. We were still only 10 minutes from the Branson strip, allowing us an easy evening out at the Dixie Stampede. Family meals grilled on the patio and fire pit s'mores were quiet moments we will remember for a lifetime. Darla was easy to work with and responded quickly to my numerous questions. ( We used the pool once for a short time with the kids one evening but there were paint chips in the pool.) Playgrounds were good for our small ones age. Thanks for this lovely gem of a cabin! We hope to return soon. We rented 3 cabins in the area for a large family reunion, including this cabin. This cabin was well kept, clean, and offered a cozy environment for the adults and children. It was only a short scenic drive to table rock lake and Branson. The beds were comfortable. The layout was nice. Great water pressure. Plenty of extra pillows and blankets. All the kicthen supplies we needed. We were so busy with everything we wanted to do that we didn't get to use the community pool or playground but it all looked fun! It was a little close to the other cabins though. Thanks for the great accommodations! On the plus side, it was spacious, comfortable, and it had a nice atmosphere. But it came with a lot of problems. The bracket on the refrigerator door was broken. When it door opened, out flew a glass beer bottle, shattering and creating a big mess! So when we went to get a mop to clean up the mess, there wasn't one. The worst part of all is that the owner was aware of the problem, but chose not to fix it before we arrived. There was no remote for one of the guest bedrooms. When I pointed this out to the owner, her reply was that " you can still operate the TV - right?". She reluctantly agreed to have the maintenance guy get one for the room. The maintenance guy later told us that he was aware of the missing remote but hadn't replaced it. Hot water was sometimes there, sometimes not. So that had to get fixed during our stay. The master bathroom toilet broke. The owner tried to get me to fix it. I reminded her that I was on vacation....... So only then did she agree to have it repaired. The fire starter for the grill was not working, so we had to go buy one, delaying our dinner. The washing machine had a bad smell. The towels also had a bad smell, and several were worn out and looked old. The owner only gave us two rolls of toilet paper for each bathroom, which wasn't nearly enough for seven people. We ran out and had to replenish. The smoke detector in the guest bedroom was inoperable, dangling from a wire.... So all of these issues negatively impacted our experience. It is worth noting that we previously stayed at another cabin near Branson and didn't experience any of these issues. For what we paid we deserved much better than we received. We will definitely not stay here in the future. I am sorry that your stay was not as good as it should have been. We strive to make everyone's stay enjoyable and all of the issues you had, have been addressed. The guests that checked out the day you checked in had completely abused and trashed the cabin. It is true that the refrigerator door shelf had been broken, but with just a couple of hours to clean and ready the cabin for your arrival, there was no way to obtain a replacement. I explained to you that parts like that have to be looked up and ordered online and then you have to wait for them to be shipped. The TV remote also had come up missing that day. My cleaning staff did neglect to try and find a replacement for that, but considering that their house had burned down the day before, I was just thankful that they were able to work at all! There was a problem with a bad heating element in the hot water heater. I immediately called the plumber to come and fix it. The toilet handle did break, probably also due to the abuse of the former guests. When you called me about it, you were extremely rude. I did NOT ask you to fix it, I simply offered a suggestion of what you could do to flush it one time so that you wouldn't have to put up with any smell until the plumber arrived. He had already been scheduled to come to work on the water heater. The smoke detector was operational. It had simply been knocked off of its bracket. I cannot fix issues that I am not aware of. Most guests realize the fact that things happen and maintenance issues will occasionally arise. As long as the issue is addressed immediately, most guests are very understanding and appreciative. In your "Welcome" information that you received, and obviously didn't read, it clearly states that if you are going to be there for a week with seven in your party that you will need to bring additional supplies of paper products along with your other necessities and food. Some guests do not take care of our property as they should, Most Are Great, and some can't be satisfied and complain about EVERYTHING! Rates are subject to change until reservation is confirmed. Pets require an additional $100. Only dogs accepted, limit of 2 under 30 lbs. Must be pre-approved. Holiday weeks require a four night minimum. Cancellation/Refunds: If you cancel your reservation on or before 60 days prior to your planned arrival date, we will refund your reservation deposit minus a 10% cancellation fee. (Cancellation Fee is 10% of the Total Rental Charges.) If you cancel after that date and we are unable to re-book your reserved dates, there will be no refund. Additionally, we will not refund money paid in advance if trip is cancelled or interrupted due to inclement weather, Acts of God, conditions of lake, appliance or utility failure, or other circumstances beyond our control, in Missouri or elsewhere.